Salam and greetings to all my blogger friends wherever you are. How's life? I hope that all of you are in the pink of health while I was away during that one week. 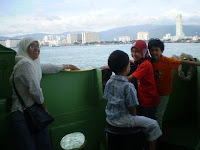 I just came home last night after my vacation in Penang. It was an enjoyable one except for the weather. It was cloudy and sometimes it rained. When it rained, there's not much that we can do! Well, that's all for now ! Will keep you update with stories about my vacation and more! So, please be patient! And don't forget to check for the new entry soon! Till then, adios! bestnya dapat cuti.... sini tak boleh nak ambik cuti hu hu hu hu keje menimbun....... penat!